Little is known about the early life of Lynn Ernest Black. According to the best sources, he was born on October 9, 1897, in Glenville, West Virginia. He was a member of a large family and probably had little formal schooling. He joined the U.S. Navy during World War I and was a Fireman 1st Class at the time of his discharge. From there, he worked as a payroll clerk with a mining company, then as a railroad fireman. Also during this time, Black attained some degree of success playing baseball with local semi-professional teams and later with Fairmont and Morgantown in the Mid-Atlantic League. In January 1922, his younger brother, Lane Black of the West Virginia State Police, was critically wounded in a gun battle and not expected to live. Hoping for retribution, Lynn Black and another brother enlisted in the force. The brother was rejected, but Lynn, described as having blue eyes, light brown hair, and a fair complexion, was added to the ranks of the WVSP on February 24, 1922. Black served in the WVSP until October 24, 1924, when he was “discharged at his own request.” From there he served as a deputy sheriff in West Virginia, and later in St. Clairsville, Ohio. His first big opportunity came in 1927 when he helped organize the Indian Hill Rangers. The Rangers, founded by wealthy families to guard their neighborhood, are now a regular police force. 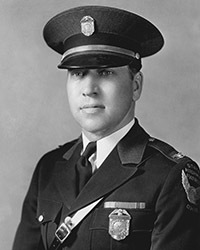 During his tenure at Indian Hill, Black caught the attention of Sheriff Asa Butterfield of Hamilton County and, in 1931, he was appointed a captain in the Hamilton County Sheriff’s Office. Black commanded the “county patrol,” a permanent force of deputies who performed all types of police work but specialized in traffic problems. Black motorized and modernized his force, and was involved in several high-profile cases, earning considerable local fame for his cunning and bravery. In late 1931, a six-year-old girl was found brutally assaulted and murdered in the basement of a Cincinnati tenement. The man who discovered the body was considered the prime suspect, but investigators were unable to obtain sufficient evidence or a confession after nearly a month of intensive questioning. It was finally Black who, pretending to be arrested and severely beaten by police, was able to convince the killer to confess. The following year, Black enjoyed considerable success in cleaning up the tough river gangs of Cincinnati, broke up a major auto theft ring, and located a wanted murderer. Black’s career as a lawman – as well as his life – nearly came to an end when he was shot leading a raid against a fugitive. In November 1932, a man wanted in the killing of an Indiana sheriff was traced to a residence in the Brown County town of Mt. Orab. Brown County Sheriff John Nue approached Lynn Black to obtain a machine gun and tear gas for the raid, and Black, along with three of his deputies, volunteered to assist. Following an exchange of gunfire, Black rushed the building, kicked open the door, and fired a tear gas canister into the house. As he stepped away from the door, he was hit in the groin by a single .38 caliber round. He staggered back to his patrol car, refusing to fall or sit down, saying only, “He shot me, boys.” Though hampered by a bout of double pneumonia during his convalescence, Black was back on the job in less than two months. It was with this background that Captain Lynn Black took the helm of the Ohio State Highway Patrol on September 20, 1933. 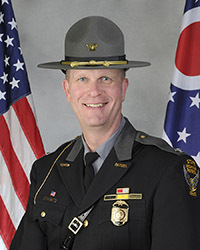 Two weeks after the official announcement of his appointment, Captain Black arrived at Camp Perry to begin training the 125 Ohio State Highway Patrol recruits. Throughout his 11 years as superintendent, Colonel Black continued to publicly espouse his most fundamental principles – no political interference with the inner workings of the division, no bullying or enforcement traps by his force, and continued modernization and progress. He enjoyed traveling the state with his beloved dog Arthur, who was his constant companion. He was a popular public speaker, winning many friends with his dry sense of humor. The dynamic era of Colonel Lynn Black came to an end on April 26, 1944, when a kidney ailment attributed to his 12-year-old gunshot wound ended his life at the age of 46. Among those at his bedside when he died was his brother Lane, the very person whose critical wounding nearly 20 years earlier had inspired young Lynn Black to become a lawman. George Mingle was born August 16, 1899, in Indiana. Educated in Michigan, he completed the 11th grade before entering the U. S. Navy. Shortly after World War I, Colonel Mingle moved to Mt. Vernon, Ohio, where he served as a deputy sheriff and ran unsuccessfully for sheriff in the mid-1920s. He applied for the new Highway Patrol on April 13, 1933. Five months later, the new recruit entered training at Camp Perry. Colonel Mingle’s early record is indicative of Colonel Black’s belief that no one should become too familiar in any particular area of the state. He was transferred five times before being assigned to Columbus in November 1934. The Colonel once remarked that he might have quit had he not been able to settle in Columbus with his wife and young son. While at Columbus, Colonel Mingle progressed to Colonel Black’s second-in-command, and was sent to Florida in the 1930s to assist in setting up a highway patrol using Ohio as a model. He assumed leadership of the Patrol at a very trying time. War needs had depleted the Patrol’s ranks to 161 officers, hardly enough to keep up with legislated tasks and extra wartime duties. With the help of the newly-formed Highway Patrol Auxiliary, which Colonel Mingle was instrumental in forming, the Division was able to meet its responsibilities. 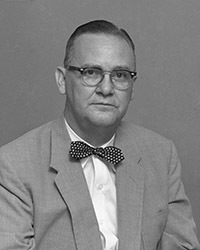 After his retirement in 1957, Colonel Mingle served as city manager for Portsmouth, Ohio, and later for Del Ray, Florida. Fred Moritz, known by friends and associates as “Fritz,” was born and raised in Columbus. After attending Ohio Wesleyan University, The Ohio State University, and Franklin University Law School, he accepted a position with the Ohio Department of Highways in the traffic division. Early in his career, he showed genuine concern for traffic safety, a talent for administration and a sound working knowledge of legislative matters. 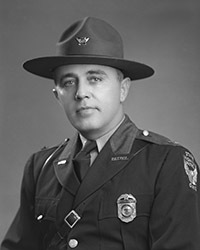 On these strengths, he became the first employee of the Highway Patrol, selected by Governor George White to assist Highways Department Director O.W. Merrell in setting up the new force. Sharing in the exciting task of organizing the Patrol, Moritz also participated as an instructor for the First Academy Class. He held the position of assistant superintendent for 24 years, handling the Patrol’s administrative and legislative matters, and serving as a troubleshooter in the areas of finance and statistics. During his tenure, the Patrol conducted research in 1957 to develop an unbiased system which would allow supervisors to evaluate the performance of the officers in their command – the Diagnostic Forced Choice Personnel Evaluation System. The Patrol began using this grading method in 1958 and it became the basis of many such systems throughout the nation. Superintendent Moritz also established the Superintendent’s Citation of Merit for any officer who participated or assisted in any action or performance of a distinguishing nature. O.W. Merrell Award winners, the Division’s highest honor for valor, are chosen from those who receive Citations of Merit. Colonel Scott B. Radcliffe was an administrator committed to improving highway safety and the working conditions of his officers. Born June 20, 1904, in Circleville, Ohio, Colonel Radcliffe was a graduate of the First Academy Class at Camp Perry, and was the Division’s first O.W. Merrell Award winner. He was honored for diving into an icy canal and holding the head of a trapped motorist out of the water for nearly 45 minutes until help arrived. As superintendent, he changed district staffing structure to incorporate a line and staff management system and upgraded supervisory ranks at district and post levels. The system proved more efficient and provided greater pay benefits to officers. Under Colonel Radcliffe’s direction the Division progressed in a number of areas and acquired its first helicopter. Leaders installed a new chemistry lab at general headquarters and hired a civilian chemist to aid field personnel with laboratory examination of evidence. During his tenure, the 105th General Assembly approved $1.5 million to build the Division’s long-awaited Academy at the Ohio State Fairgrounds. Committed to assisting his officers to do the best possible job in the most efficient way, Colonel Radcliffe gave authority to Auxiliaries in 1963 to assume desk and dispatcher duties, in order to free the patrol officers for road work. For more than 30 years, Colonel Radcliffe shared in the building and development of the Patrol. As superintendent he guided its growth from 1959 to 1964, a task he assumed with enthusiasm, dedication, and the wisdom of a seasoned officer. Colonel Radcliffe passed away April 13, 1988. In honor of his contributions and allegiance to the Patrol, the funeral service was conducted at the Academy, the first in its history. By the time he became superintendent, Colonel Cook possessed the most extensive and varied assignment record of any previous superintendent. A Columbus native, he attended Wittenberg College. He joined the Patrol with the Fourth Class in 1935. While working his way through the ranks, he served at 10 posts in all four corners of the state and at all levels of supervision. One of his priorities was to raise officers’ salaries. During his first month as superintendent, he abolished the rank of patrolman II and promoted the 69 officers in that rank to corporal. The following month he promoted the 54 officers who previously held the rank of corporal to sergeant, effectively securing pay increases for all of the promoted officers. He also established the Resident Patrolman program, which provided a permanent patrolman in counties without a Patrol post. With a resident officer working from his home, the program ensured no county was without a Patrol presence. Colonel Cook retired in October 1965 after reaching the mandatory retirement age of 55. He accepted an appointment as executive director of the newly formed Ohio Peace Officer Training Council, a position he held for 12 years. In retirement, he remained a devoted supporter of the Patrol and a frequent guest at special events. Colonel Cook died in Columbus on May 31, 2003, at the age of 93. Colonel Chiaramonte directed the Patrol through a period of tremendous change and growth. As society struggled through the social changes of the 1960s, he supervised Patrol action at 33 riots and demonstrations and secured funding for proper protective equipment for officers working these sometimes dangerous details. He instituted most of the Patrol’s recognition awards, including the Blue Max auto larceny enforcement program which became a model for similar programs across the country. Colonel Chiaramonte began training with the 16th Class in November 1941. An injury forced him to complete his training and graduate with the 17th Class in 1942. While assigned to the Office of Personnel, he built an impressive record in matters including officer selection, training, and evaluation. He was appointed superintendent following the retirement of Colonel Anson B. Cook. Colonel Chiaramonte retired on April 5, 1975. He continued service in state government and was named director of the Department of Highway Safety in 1976. Born in Ashtabula, Ohio, on September 6, 1920, Colonel Chiaramonte attended The Ohio State University and Franklin University. His legacy of service is honored each year with the Patrol’s Robert M. Chiaramonte Humanitarian Award. The award honors officers for dedication to humanitarian causes. Colonel Blackstone was born March 8, 1922, in Columbus, Ohio. He entered the U. S. Navy in 1942, where he served three years. He applied to the Patrol a scant three weeks after his discharge, and entered the “Fighting 19th” Academy Class – comprised almost entirely of men recently returned from World War II – three weeks after that. Commissioned in 1946, Colonel Blackstone served at Lima, Findlay, and Columbus before receiving his transfer to general headquarters in 1950. While much of his career was spent supervising land acquisition, physical facility construction, purchasing equipment and services, and administering the Division’s contractual agreements, Colonel Blackstone’s real forte centered on communications systems design and implementation. He supervised the early development of LEADS, the Law Enforcement Automated Data System, which ushered in a new era of communications. Almost overnight, LEADS was able to provide vital information to road officers within seconds. The impact of this breakthrough is comparable to the advent of the two-way radio in terms of officer safety and efficiency. He also initiated the development of an eight-state, regional law enforcement computer system which provided information on licensed drivers and registered vehicles. Another significant contribution to communications was involvement in a project called LEERN (Law Enforcement Emergency Radio Network), which allowed communication between different agencies from base to base, base to car, or car to car. Prior to LEERN, radio communication between officers of different departments was not possible. Colonel Adam G. Reiss devoted 32 years of service to the Patrol, including three years as its superintendent. He was born July 18, 1924, in Cleveland. He served four years in the U.S. Marine Corps, attaining the rank of staff sergeant before his discharge in 1946. He joined the Patrol in 1947 with the 23rd Class, and spent more than 20 years in the field, serving at Salem, Poland, Northfield, Canfield, Hiram, Warren, Delaware, and Cambridge. His extensive field experience eminently qualified him for the position of commander of the Division’s field operations, a position he held from 1968 until assuming the superintendency in 1976. Implementation of the Patrol’s first federally-funded selective traffic enforcement program also came about during Colonel Reiss’ tenure. Called SMASH (Selective Management of Accident Site Highways), the crash reduction program was so successful that variations of the original followed into future decades. Another important achievement during Colonel Reiss’ tenure was a hazard pay supplement to provide increased pay to officers for hazards faced in the line of duty. He also placed strong emphasis on public information and education. The Junior Trooper program, first conducted in 1977 to teach safety concepts to children aged 6 to 12 years, reached thousands of youngsters throughout the state. In retirement, he remained active with the Division and served as chaplain for the Retirees’ Association. Colonel Reiss passed away June 12, 2008, in Columbus. 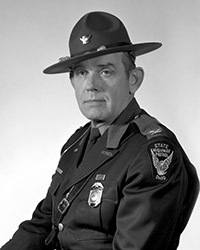 Colonel Jack B. Walsh served more than 29 years with the Patrol, including 10 years as superintendent. His tenure was topped by a remarkable 25 percent reduction in rural fatalities during the seven-year period from 1979-1986. He initiated Operation CIN (Confiscate Illegal Narcotics), which resulted in dramatic increases in drug seizures and required upgrades to the crime laboratory to keep up with evidence submissions. During a time of severe energy shortages, Colonel Walsh helped develop and institute one of the nation’s most effective and imitated police fuel economy programs. His concern for maintaining a healthy and physically fit workforce led to the construction of a health and physical fitness center at the Training Academy. He further emphasized officer safety on several other fronts including the use of high-visibility clothing during traffic control and new self-defense and firearms training designed to instill officer confidence in every situation. Colonel Walsh brought state and national recognition to the Patrol through his service to several professional law enforcement associations. He was an active member of the International Association of Chiefs of Police, serving as General Chair of the State and Provincial Police Division. Colonel Walsh began his Patrol career in 1958 as a dispatcher at the Georgetown Post. A little more than a year later, he entered training as a member of the 50th Class. In addition to extensive field experience, he also served as an administrative assistant to Patrol superintendents Robert Chiaramonte, Frank Blackstone, and Adam Reiss. He was in his third year as commander of the Piqua District when he was chosen to replace the retiring Colonel Reiss. A native of Portsmouth, Colonel Walsh was born on July 30, 1935. He served in the U.S. Army prior to joining the Patrol. Colonel Thomas W. Rice was the Division’s 10th superintendent. He brought to the office the most extensive educational background of any previous superintendent, including a bachelor's degree in criminology and master's degrees in public administration and labor and human resources. During establishment of the Division’s first labor contract, Colonel Rice worked with labor and management officials to secure a contract beneficial to all parties. Later, his skills as a negotiator were tested during the 1993 riot at the Southern Ohio Correctional Facility. Colonel Rice served on a team of negotiators that met with leaders of rioting inmates. During Colonel Rice’s tenure, drug detection canines were obtained to cover known drug routes on Ohio highways. Colonel Rice also directed the placement of Traffic and Drug Interdiction Teams (TDIT) which made Ohio one of the most feared states for criminals transporting illegal drugs. Concerned for officer safety in light of growing firepower on the streets, Colonel Rice ordered the purchase of upgraded weaponry, body armor, and handcuffs, and instituted the first mandatory body armor use policy. Colonel Rice was born June 7, 1939, and raised in Chillicothe where his father, George Rice, was chief of police. He began his Patrol career in 1960 as a cadet dispatcher. He entered training as a member of the 55th Class. He served as commander at Hamilton and also held several positions at the Training Academy, from instructor through commandant. He served as commander of the Office of Personnel prior to being appointed superintendent. 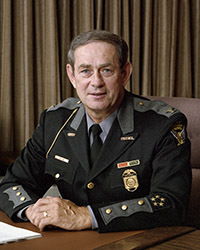 After his retirement in January 1994, Colonel Rice served as Director of Public Safety for the city of Columbus, and as federal security director at Port Columbus International Airport. 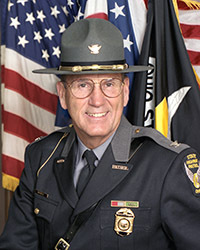 Colonel Warren H. Davies took the reins as superintendent of the Patrol on January 21, 1994, capping a 27-year career in which he distinguished himself as a dedicated and talented administrator. An August 1966 graduate of the 71st Academy Class, Colonel Davies was the first superintendent to train at the Division’s current Training Academy. As a trooper, he served at Elyria, where he was Post and District Trooper of the Year in 1972. He later held the position of assistant post commander at Canfield, and later at Massillon, at the rank of sergeant. Colonel Davies’ first command assignment was in 1977 at Delaware. He served as assistant district commander at Massillon and Columbus, and as commander of the Cambridge and Massillon districts. After extensive experience in all aspects of field work, Colonel Davies transferred to general headquarters in the Office of Field Operations. He later transferred to the Office of Investigative Services. 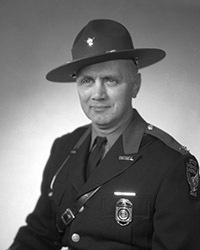 Under Colonel Davies, the Patrol made aggressive enforcement the centerpiece of efforts to increase safety on Ohio roadways. An increase in traffic arrests coupled with a high level of visibility led to a six percent decrease in rural traffic fatalities during his tenure. In addition, Traffic and Drug Interdiction Teams (TDITs) realized continued success in stemming the flow of illegal drugs through Ohio, seizing narcotics worth millions of dollars during the course of normal traffic stops. 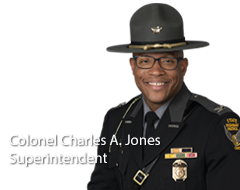 Colonel Davies also provided leadership as the Patrol increased efforts to reduce crashes on Ohio roadways and provide the highest level of public assistance. This, and the effort to maintain the best trained and equipped force in the nation, continued to guide the Patrol into the 21st century. Colonel Davies retired from active service on February 28, 1997, after more than 30 years of distinguished service. 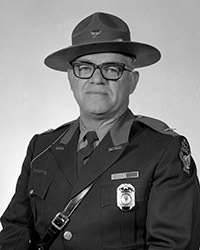 Colonel Marshall became superintendent of the Patrol on February 28, 1997. 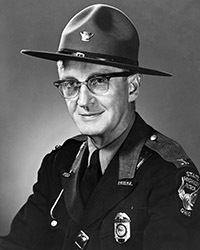 He led the Division during a time of innovation, including the creation of several successful traffic safety initiatives still utilized by troopers. To address aggressive driving behaviors, or road rage, Colonel Marshall introduced Operation TRIAD (Targeting Reckless, Intimidating, and Aggressive Drivers) in 1997. The program used aircraft enforcement to target violations that are typically difficult to detect and enforce by road troopers. Hundreds of Operation TRIAD details resulted in thousands of aggressive driving citations for violations such as passing on the berm, following too closely, and excessive speed. Colonel Marshall also was a champion of Partners for Safety, which emphasizes partnerships with businesses, community groups, health and safety organizations, law enforcement agencies, and schools to reduce traffic crashes while achieving voluntary compliance with traffic laws. It was through a Partners for Safety initiative that the Patrol entered into a long-standing partnership with Roadway Express to emphasize the importance of commercial and passenger vehicles sharing the road safely. Colonel Marshall joined the Patrol in 1969 with the 84th Academy Class. Originally from Salem, he is a Vietnam War veteran of the U.S. Navy. Colonel Morckel’s contributions to homeland security and professional police services left a lasting impact in Ohio. 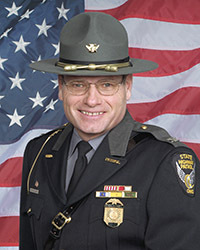 He directed the Patrol’s initial post-9/11 homeland security efforts, and as a member of the State of Ohio Security Task Force, served as chair of Law Enforcement Sub-Committee. To further enhance homeland security, he directed the establishment of the LEADS Intelligence Information System, which provided users the ability to submit arrest and contact information that may be useful to other law enforcement agencies in the state. He also coordinated an innovative bias-based policing strategy that included policy changes and training initiatives and made traffic stop diversity data and complaint statistics easily accessible to the public. Most notably, through an increased emphasis on combining public education with effective enforcement, Ohio experienced a significant reduction in rural traffic fatalities during 2000 and 2001. Colonel Morckel graduated with the 99th Academy Class in 1975 and served 17 years in the field before a 10 year-span in which he earned promotions through four management-levels, ending when he was sworn in as superintendent in June 2000. 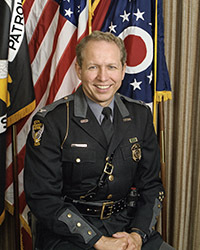 After retiring from the Patrol in 2003, Governor Bob Taft appointed Colonel Morckel director of the Department of Public Safety, a position he held until the end of 2006. Known nationally for his work to reduce traffic crash deaths, Colonel McClellan’s tenure as superintendent was marked by creative initiatives and a series of impressive accomplishments. His LifeStat 1.0 program was recognized as one of the 10 best law enforcement initiatives in the United States, and stimulated a remarkable six-percent reduction in crash fatalities during 2006 – at the time, the lowest rate since the first years of the Patrol’s existence. Colonel McClellan believed the biggest impact of LifeStat 1.0 was a shift in decision-making, with each employee taking responsibility and accountability for decisions made on the job. According to Colonel McClellan, forward-thinking is crucial to the Patrol. “If we don’t prepare for change, if we don’t embrace change, then we’re not going to be as relevant in the future,” he said. Colonel McClellan served 32 years with the Division. His first command assignment was at the Springfield Post where he helped establish the “Mock Fatal Crash” program used in high schools throughout the nation. He also was prominent for his work developing commercial motor carrier enforcement programs and safety partnerships with the trucking industry. Early in his career, he achieved recognition as State Trooper of the Year. Colonel McClellan said he enjoyed his time as a trooper, learning what he could about auto larceny and about how things worked within the Division. During his tenure as superintendent, Colonel Collins worked to expand metro traffic programs while also increasing emphasis on criminal patrol activities. Under his command, the number of traffic fatalities in Ohio reached historic lows, including substantial reductions in urban areas. While Ohio roads were getting safer, state troopers also directly impacted the safety of Ohio communities and neighborhoods. Through Colonel Collins’ 24/7 Initiative, data analysis and geo-mapping were utilized more than ever to help troopers maximize efforts in both areas. The program also significantly reduced case-related paperwork for road officers. Colonel Collins began his Patrol career as a cadet dispatcher at the Marion Post in his hometown. He trained with the 108th Class and served at various assignments in the field while moving up the ranks, including seven years as commander of the 12-county Findlay District in northeast Ohio. Colonel Collins retired on September 18, 2009, after more than 31 years of service. 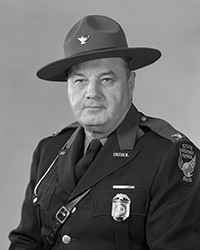 Colonel David W. Dicken served as the 16th Superintendent of the Ohio State Highway Patrol. Dicken succeeded Interim Superintendent Captain Kevin Teaford who led the Patrol from September 18, 2009 until the end of the year, following the retirement of Colonel Richard H. Collins. Dicken had served as executive officer of the Office of Finance and Logistic Services and was responsible for the preparation, implementation and management of the Patrol’s biennial operating budget, as well as the biennial capital budget. He worked in various capacities with the Office of Finance and Logistic Services, previously serving as executive officer and commander of the Fiscal Services Section. 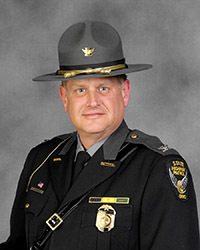 He began his career with the Ohio State Highway Patrol in 1990 as a trooper, and was a member of the 120th Class. He is a graduate of the University of Cincinnati and the Northwestern University Center for Public Safety School of Police Staff and Command. A Cincinnati native, Dicken served in assignments at the Portsmouth, Georgetown and Swanton Posts, and the Patrol’s General Headquarters. John Born was appointed director of the Ohio Department of Public Safety (DPS) in 2013 by Governor John R. Kasich. 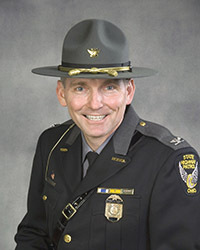 He previously served as Colonel and superintendent of the Ohio State Highway Patrol capping a 26-year law enforcement career. Through safety, service and protection, the 3,600 DPS employees are dedicated to the mission of contributing to a safer Ohio through six divisions: the Ohio State Highway Patrol; Bureau of Motor Vehicles; Homeland Security; Emergency Management Agency; Emergency Medical Services; and Office of Criminal Justice Services. In 2013, the Department implemented the Safer Ohio Initiative which contributed to record low numbers of traffic crash fatalities and the fewest number of alcohol-impaired crash deaths in Ohio while criminal interdiction increased to record levels. That year, Ohio led the United States in the greatest reduction in traffic crash deaths. The Safer Ohio Initiative also incorporates a comprehensive strategy of emergency preparedness. For the first time in Ohio history, the Ohio Emergency Management Agency is now providing 24/7/365 support and operational staffing through an integrated intelligence approach. Consolidated departmental resources have also allowed additional investments in intelligence analytic services for law enforcement, homeland security and first responders. Additional components include the development and training of Safe Ohio Teams, training and equipping of Emergency Resource Teams, certification and deployment of state employees to serve the American Red Cross, purchase and prepositioning of key emergency equipment and services, development of new private and public sector partnerships, improving security and hardening of key infrastructure, and developing additional technological applications to leverage public participation. Director Born helped develop key elements of Governor Kasich’s Safer Schools Initiative including integrating Ohio Homeland Security threat assessment and safety plan reviews while also deploying explosive-detection canines for the first time to Ohio’s state universities. A new Threat Assessment and Prevention Unit (TAP) is staffed with analysts who completed U.S. Secret Service and FBI threat assessment training and are now integrated into school safety efforts. An investment in training has been bolstered with the recent integration of an undergraduate level public safety leadership course conducted by The Ohio State University and a graduate level multi-year course operated by the Ohio Association of Chiefs of Police. Training for both programs is now conducted at the newly opened leadership wing at the Ohio State Highway Patrol Academy. Ohio now also leads the nation in first responders trained in the Traffic Incident Management safety program and the number of certified Drug Recognition Expert (DRE) officers have increased to take Ohio from one of the lowest DRE officer trained states to one of the states with among the most. Cost reductions, such as the transition of the last state operated BMV Customer Service Center in Columbus to a private sector operation has led to a $1 million annual state payroll reduction while also creating private sector jobs and increasing public service to six days per week. Building on the BMV’s highest reported customer satisfaction in the country, new 24/7 BMV customer self-service terminals will also soon be piloted in Ohio to allow Ohioans to receive vehicle registration renewals stickers in grocery stores and other retail businesses. As Patrol Superintendent, his reprioritization of the Patrol’s focus elevated criminal patrol to the same mission level as highway safety and led to a record interdiction of over $147 million in drugs and contraband in just three years. He implemented significant changes to the Patrol’s organizational structure. To streamline operations, he directed the merging of homeland security, intelligence, and communications through the creation of the Hub; a center staffed 24/7/365 by Patrol commanders, intelligence analysts and communications staff. In addition, a number of officers were moved from general headquarters into operational roles, a senior advisors group was created to broaden field commander input into key decisions, metro patrol posts were established in Ohio’s most-populous counties, and Patrol drug-detecting canines were increased to the most in Patrol history and the new dogs were assigned to locations throughout the state. From 2011 to 2013, the Patrol’s law enforcement partnerships were dramatically strengthened through “Shield” details where troopers and local law enforcement officers work together to reduce crashes, target criminal activity and wanted felons, and improve the quality of life for citizens. Maximizing law enforcement collaboration, more troopers were assigned to federal and local task forces than ever before in the Patrol’s history. During that same time, the Ohio Investigative Unit was merged with the Patrol’s Office of Criminal Investigations and led to Ohio’s national leadership role in trace-back investigations of alcohol violations which contribute to alcohol-related crash fatalities. The Ohio Traffic Safety Office was merged under Patrol oversight to better coordinate federally-funded traffic safety efforts. Personnel shortages were repaired with the graduation of five cadet classes. In two years, the Patrol selected, hired and trained nearly 300 new troopers while operating on a budget that had remained the same since 2007. Cadet training was cut from 30 weeks to 22 weeks, saving more than $580,000 through more efficient scheduling of cadet time. A nationally innovative statewide computer model, TEV (time efficiency value), also was established to better measure and balance road troopers’ time. Director Born holds Bachelor of Science in journalism and Master of Social Science in deviant behavior degrees from Ohio University. He completed the FBI’s National Executive Institute, governance training at Harvard Business School, and leadership training at the United States Army War College. 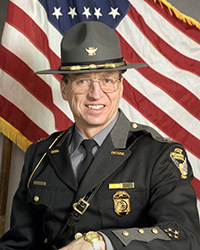 He served as co-chair of Ohio’s Task Force on Community and Police Relations; chaired an international law enforcement officer safety effort; served as chairman of Ohio’s law enforcement computer network; and has served as Chairman of the Board of one of Ohio’s five state pension systems. He has earned the United States Department of Homeland Security Partnership Award, the United States Secret Service Director’s Honor Award, and the International Association of Chiefs of Police prestigious J. Stannard Baker Award. He and his wife, Kathy, have two grown children. 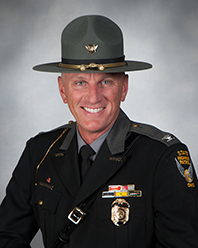 Director of Public Safety John Born and Governor Jon Kasich appointed Colonel Paul A. Pride as superintendent on July 31, 2013. He joined the Patrol in 1989 as a member of the 118th Academy Class. He received his commission in November of that year and his first assignment was at the Marietta Post. In 1990, he received the Patrol’s Superintendent Citation of Merit Award. As a trooper, he was selected as both Post and District Trooper of the year in 1992. In 2016, the Ohio Attorney General presented him with the Distinguished Law Enforcement Service Award (Mark Losey Award). In 2017, he was inducted into the Buckeye Boys State Hall of Fame. Bellefontaine Police Department's Chief and prior president of the Ohio Association of Chiefs of Police (OACP), Brandon Standley, awarded Colonel Pride with the OACP President's Award in 2018 for building law enforcement relationships in Ohio. Colonel Pride’s vision for criminal patrol efforts was integral on the program's success. The criminal patrol program has grown to be an essential part of the Patrol and partner agencies. In 2018, criminal patrol baseline training was provided to more than 2,600 officers from 215 law enforcement agencies. An in-house canine training program began in 2015, and in 2018 the Patrol’s Canine Training Facility opened in Marysville. The Advanced Criminal Interdiction Ride Training (ACIRT) program began in 2014. During the PROTECT Detail in Cleveland, troopers made more than 1,000 traffic stops, removed more than 21,000 grams of narcotics from the streets and recovered 25 illegal weapons. In 2016, Colonel Pride led the Patrol during the Republican National Convention (RNC). He authorized the largest commitment of personnel and resources for a single event in the Patrol’s history. There were 500 troopers deployed to Cleveland to work with outside officers to make the RNC a success. The partnerships created with law enforcement agencies are what helped make the outcome of the RNC a positive one. He also worked closely with the Ohio ASSIST Program beginning in 2016. Ohio ASSIST - Aiding Safety Services with Incident Survival Techniques - is a statewide program that works with safety service partners to provide follow-up care and resources to safety service personnel. He has an Associate of Applied Science degree in Law Enforcement from Ohio University. He has completed Northwestern University’s School of Police Staff and Command and training at the FBI’s National Academy. He and his wife Tina have two children and three grandchildren. On March 15, 2019, Colonel Paul A. 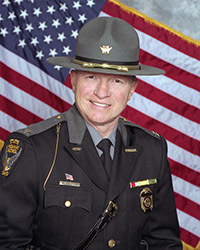 Pride retired as the 18th superintendent of the Ohio State Highway Patrol after 29 years of service. Call #677 or click HERE to email.